FISH GUTS ON THE KITCHEN SINK WERE MONICA JONES UNUSUAL, AND RATHER SMELLY ROUTE TO GETTING HER DEGREE IN ART. By Lynda Cookson Her father was employer in the dockyard in Cobh, and the family were heavily involved in leisure fishing. This meant a rather abundant amount of fish being gutted in the Jones household, almost daily. In the company of a few jars of formaldehyde preserving her subject, Monica would trot off to classes each day, spill her guts, and paint. She got her degree. Although she qualified using oil paint as her main medium, she found herself with insufficient time and space to pursue oils, and began to explore using watercolour and pencil as more practical materials to suit her lifestyle. Over the next few years, when she settled in West Cork, Monica took pencil and ink techniques as far as she possibly could, producing fine sketches of structures, stones and horticultural details. During this time, and while she was teaching art in schools, she was working on commissions, in particular recording the restoration work of Rathbarry Castle in her delicate sketches. The restoration of Kilkoe Castle and then Castle Freak followed, over a number of years. GIVING Skimming past Monica’s years of teaching in schools would be a mistake. She put a lot of work giving the children a wider perspective of art, giving them a chance to see their work in a public context. She completed workshops with the children, putting their ideas into three categories of The Magic Kingdom, The Magic Fruit Garden and The Valley of Magic and Wizardry. She enlarged their drawings into a college, and with the help of the school caretaker, the playground was prepared, paint and paintbrushes were purchased, and the groups of children set to mixing their colours spontaneously while painting their mural. This motivating and challenging experience taught the children about contrast, colour, tones and shades, as well as how to use acrylic paint and a number of techniques in brush stroke and blending. It is most unlikely that any of those children will ever forget those precious hours spent producing their first public artwork. UNIQUE About six years ago, Monica felt she needed a career break, so she took time off from teaching in schools to give her self more time to paint and to teach privately. She rediscovered landscapes and, a few extremely successful exhibitions later, has never looked back! During this time, she worked primarily on location to capture mood and spontaneity, using pencil and Indian ink as the ideal form to grasp texture and the ever-changing light, which is unique to West Cork. As you can imagine, working on location can be an interesting experience for an artist! Monica went from the isolated and slightly scary forest of Castle Freak, where she felt strange and nervous, to fishing ports and harbours, where she has been showered with warmth and friendliness, with people stopping by to suggest new places where she should sketch. In the old port of Barlogue, just outside Baltimore, early one morning, an elderly fisherman was thrilled to find her sketching his eighty year old fishing boat, which had see faithful service for all those years. She was equally thrilled to have been able to give such pleasure to a seasoned old fisherman, whose pleasure and pride was so evident. Talking about techniques and processes in art, it emerged that she was not aware that she had a process until it was pointed out to her by several people during last year. It involves a lot of sketching and drawing, note-taking, and pushing herself creatively to a point of frustration, finally emerging on the other side with a finished piece of art work. 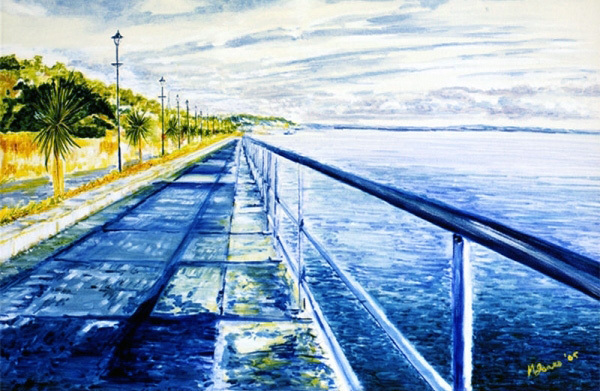 The content of her work dictates the technique, for example one of her most recent paintings entitled The Waters Edge need strong use of colour, so oils became the preferred technique. 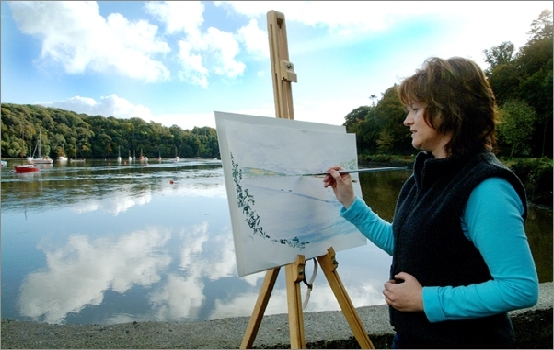 CONNECTION For Monica, the ideal way for her to be artist is to live in a location like West Cork, within a small community surrounded by breathtaking scenery, to have a connection with other artists, and have time to absorb, to daydream and just to breathe. To help her balance family life and her career as an artist, she enrolled in a time management workshop, which went a long way towards identifying her needs as an artist and balancing her needs with her responsibilities as a mother.